FROM winning performances and opening the Tamworth Country Music Festival, to writing with award-winning artists and releasing his debut single to radio, Aaron Jurd has achieved it all in a few years. The Lake Macquarie singer-songwriter spent five years playing gigs in cover bands and duos before he chased his ultimate goal of releasing original music. His debut single, Set Me On Fire, tells of the emotional struggles that come with reaching the lowest point in your life, but knowing there is a way out, although you haven’t found it yet. Aaron graduated from the 2018 CMAA Academy of Country Music and, with his fellow graduates, performed at the Official Opening Concert of the Tamworth Country Music Festival. During his time at the academy, he worked with Amber Lawrence, Fanny Lumsden, Kasey Chambers, and Kevin Bennett. Aaron co-wrote a song with seven-time Golden Guitar winner Allan Caswell. With his strong vocal abilities, 2013 and 2014 saw Aaron named a finalist in Today's Country 94one Brand New Star Competition. His success in 2014 meant he was selected to join 10 other artists for a song workshop with country music artist Gina Jeffreys where he co-wrote a song with the star. 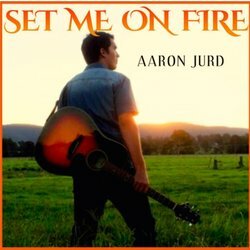 WHEN you hit rock bottom, the only way is up, which is the message singer-songwriter Aaron Jurd is spreading with his new single, Set Me On Fire. The single came from the artist's lowest point of his life to date when his home life wasn’t happy, he’d been burned by people he trusted and he wasn't achieving his musical goals.